Oath of the Horatii (French: Le Serment des Horaces), is a painting by Jacques-Louis David accomplished in 1784, before the French Revolution, which depicts the Roman salute. It grew to be considered as paradigm of neoclassical painting. The painting increased David's fame, and allowed him to rear his own students. The painting illustrates the three sons of Horatius swear on their swords, held by their father, that they will defend Rome to the death. The principal sources for the story behind David's Oath are the first book of Livy (sections 24-6) which was elaborated by Dionysius of Halicarnassus in book 3 of his Roman Antiquities. However, the moment depicted in David's painting is his own invention. Painted while in Rome, the artist references Enlightenment values while alluding to Rousseau’s social contract. The republican ideal of the general will becomes the focus of the painting with all three sons positioned in compliance with the father. The Oath between the characters can be read as an act of unification of men to the binding of the state. The issue of gender roles also becomes apparent in this piece, as the women in Horatii greatly contrast the group of brothers. David depicts the father with his back to the women, shutting them out of the oath making ritual; they also appear to be smaller in scale than the male figures. The masculine virility and discipline displayed by the men’s rigid and confident stances is also severely contrasted to the slouching, swooning female softness created in the other half of the composition. Here we see the clear division of male-female attributes which confined the sexes to specific roles, under Rousseau’s popular doctrines. In the year 1774, David won the Prix de Rome with his work Érasistrate Découvrant la Cause de la Maladie D'antiochus. This allowed him to stay five years (1775-1780) in Rome as a student from the French government. Upon his return to Paris presented an exhibition, in which Diderot praised his paintings, the success was so resounding that King Louis XVI of France, allowed him to stay in the Louvre, a very ancient privilege desired by artists. There he met Pecoul, contractor for the actual buildings, and Pecoul's daughter, with whom he married. The king made him work on the Oath of Horatii, with the intention that it was an allegory about loyalty to the state and therefore to the king. As he approached the French Revolution, paintings increasingly referred to the loyalty to the state rather than the family or the church. Although this picture was made nearly five years before the Revolution, the Oath of the Horatii, became one of the images representing the time. In the year 1789, painted The Gross lictores carrying the bodies of their children, a picture that was also a royal commission. Ironically, shortly after, the king would go up to the scaffold also accused of treason, as the sons of Brutus, and with the vote of the artist in the National Assembly, which supported the execution of Louis XVI. The painting depicts three members of the Roman Horatii family, who, according to Titus Livius' Ab Urbe Condita (From the Founding of the City) had been chosen for a ritual duel against three members of the Curiatii, a family from Alba Longa, in order to settle disputes between the Romans and the latter city. As revolution in France loomed, paintings urging loyalty to the state rather than to clan or clergy abounded. Although it was painted nearly five years before the revolution in France, the Oath of the Horatii became one of the defining images of the time. In the painting, the three brothers express their loyalty and solidarity with Rome before battle, wholly supported by their father. These are men willing to lay down their lives out of patriotic duty. In this patriarchal society, the steely men, with their resolute gaze and taut, outstretched limbs are citadels of republican patriotism. They are symbols of the highest virtues of the Republic, while the tender-hearted women lie weeping and mourning, awaiting the results of the fighting. The mother and sisters are shown clothed in silken garments seemingly melting into tender expressions of sorrow. Their despair is partly due to the fact that one sister was engaged to one of the Curiatii and another is a sister of the Curiatii, married to one of the Horatii. Upon defeat of the Curiatii, the remaining Horatius journeyed home to find his sister cursing Rome over the death of her fiancé. He killed her, horrified that Rome was being cursed. Originally David had intended to depict this episode, and a drawing survives showing the surviving Horatius raising his sword, with his sister lying dead. David later decided that this subject was too gruesome a way of sending the message of public duty overcoming private feeling, but his next major painting depicted a similar scene - Lucius Junius Brutus brooding as the bodies of his sons, whose executions for treason he had ordered, are returned home. The painting shows the three brothers on the left, the Horatii father in the center, and the sister/wives on the right. The Horatii brothers are depicted swearing upon (saluting) their swords as they take their oath. The men show no sense of emotion. Even the father, who holds up three swords, shows no emotion. On the right, three women are weeping -- one in the back and two up closer. The woman dressed in the white is a Horatius weeping for both her Curiatii fiancé and her brother; the one dressed in brown is a Curiatius who weeps for her Horatii husband and her brother. The background woman in black holds two children -- one of whom is the child of a Horatius male and his Curiatii wife. The younger daughter hides her face in her nanny’s dress as the son refuses to have his eyes shielded. "This painting occupies an extremely important place in the body of David’s work and in the history of French painting. The story was taken from Livy. We are in the period of the wars between Rome and Alba, in 669 B.C. It has been decided that the dispute between the two cities must be settled by an unusual form of combat to be fought by two groups of three champions each. The two groups are the three Horatii brothers and the three Curiatii brothers. The drama lay in the fact that one of the sisters of the Curiatii, Sabina, is married to one of the Horatii, while one of the sisters of the Horatii, Camilla, is betrothed to one of the Curiatii. Despite the ties between the two families, the Horatii's father exhorts his sons to fight the Curiatii and they obey, despite the lamentations of the women." The background is de-emphasized, while the figures in the foreground are emphasized to show their importance. The use of dull colors is to show the importance of the story behind the painting over the painting itself. The picture is clearly organized, depicting the symbolism of the number three and of the moment itself. The focus on clear, hard details and the lack of use of the more wispy brushstrokes preferred by Rococo art. The men are all depicted with straight lines mirroring the columns in the background signifying their rigidity and strength while the women are all curved like the arches which are held up by the columns. The use of straight lines to depict strength is also demonstrated in the swords, two of which are curved while one is straight foreshadowing that only one brother would survive the encounter. The brother closest to the viewer (presumably destined to be the sole survivor) is dressed in colors matching that of the father while the garb of the other brothers is obscured but seems to mimic the colors being worn by the women. The frozen quality of the painting is also intended to emphasize rationality, unlike the Rococo style. The only emotion shown is from the women, who were allowed to feel, while it was for the men to do their duty with heroic determination. The fact that it also depicts a morally complex or disturbing story lends to its classification as a neoclassical work. When the royalty, churchmen, and aristocrats went to view the painting, they eulogised it; the Pope himself expressed his desire to view The Oath of the Horatii. David wanted the painting exhibited in the Salon, but it was delivered late, and enemies of him at the Academy took advantage to exhibit it in a poor locale in the gallery. 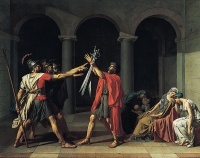 In the event, public dissatisfaction with the poor viewing conditions obliged the gallery to move the painting to a site proper for viewing the painting; moreover, David held The Oath of the Horatii on exhibit for some extra weeks, to permit reporters to write about all of the paintings exhibited, not just his. David's painting also inspired artists in later generations such as William Sidney Mount in his School Boys Quarreling. Unless indicated otherwise, the text in this article is either based on Wikipedia article "Oath of the Horatii" or another language Wikipedia page thereof used under the terms of the GNU Free Documentation License; or on original research by Jahsonic and friends. See Art and Popular Culture's copyright notice. This page was last modified 20:06, 28 May 2011.